I think just last week I was crossing my fingers and toes that summer weather would arrive, and then just like that 90-degree temperatures rolled in and I’m already complaining about the heat. Funny how that happens, right? I did find a few fun ways to cool off from the heat wave while recently visiting family though. 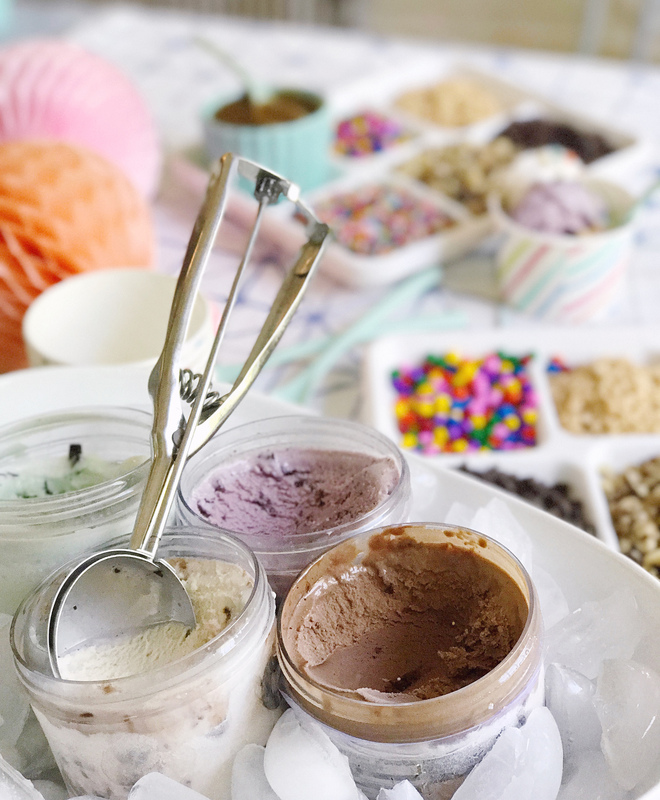 We dipped our toes in my cousin’s pool, enjoyed some evening time on my parent’s new farmhouse porch, and decided to host a little ice cream sundae party over the weekend. 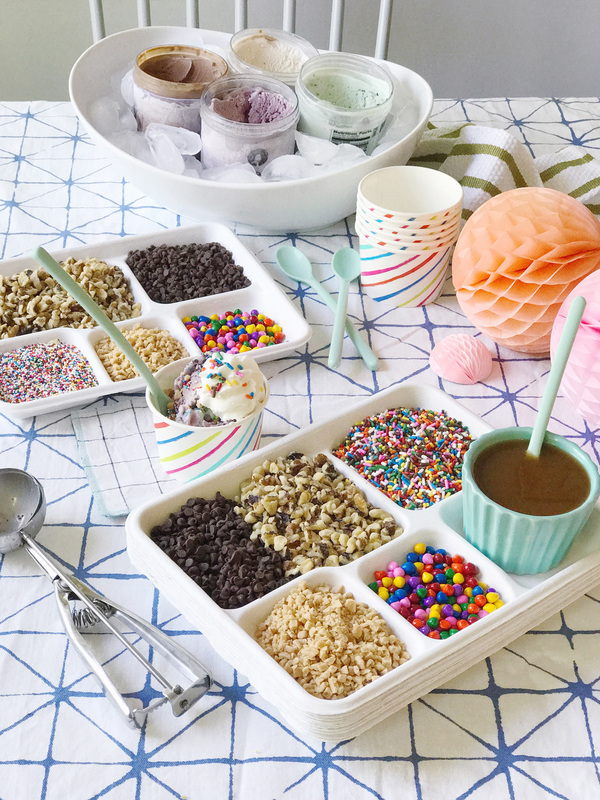 Setting up an ice cream sundae bar has to be the easiest – and impressive – dessert option when you’re entertaining. 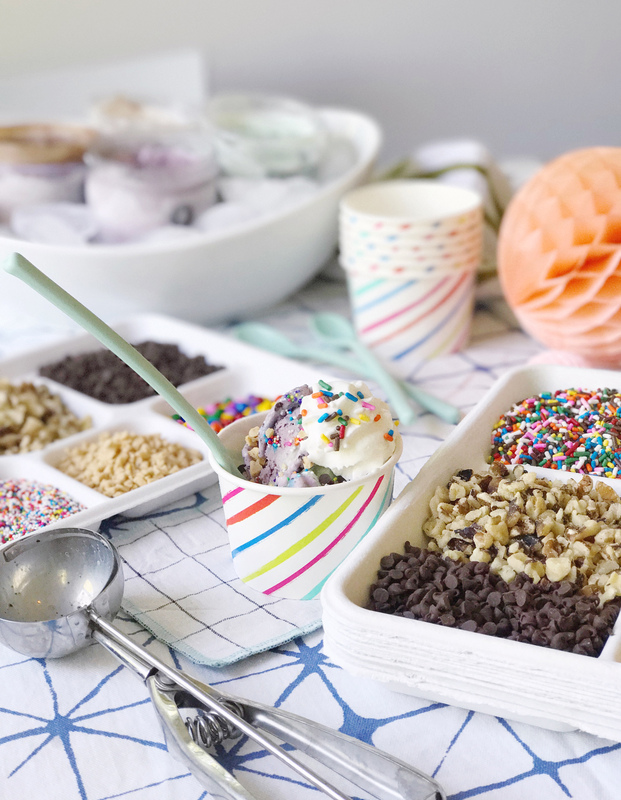 I thought I’d share a few tricks for how I set up my own ice cream sundae bar when I host, just in case you get the craving for one this summer too! Start with the Ice Cream, of course! We eat with our eyes first, so I always look for a variety of the prettiest ice cream colors. A black raspberry has that rich purple tone, and a tasty mint chocolate chip is the perfect cool color. A chocolate variety and vanilla variety are always classics to have on hand too – we went with chocolate fudge brownie and vanilla cookie dough on this particular occasion. Keep it cool. Ice Cream can melt fast on a warm day (duh, you knew that!). So I fill up an oversized serving bowl with a bit of ice, pack in the ice cream containers, and then add more ice around each pint to keep the whole thing cool. You could even do this before a party and store the whole thing in your freezer before guests arrive – just pop the tops off the containers and you’re ready to serve. Display your toppings. 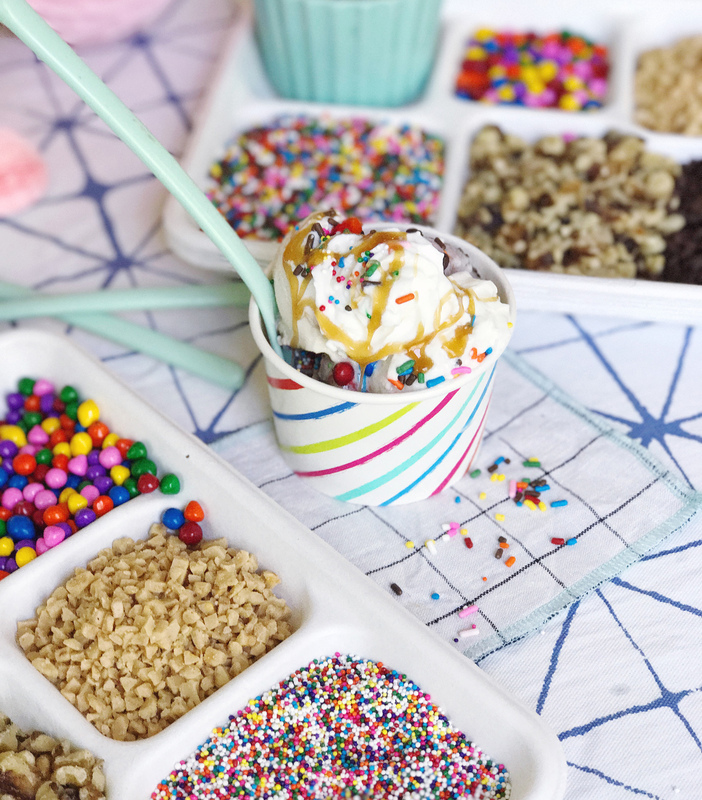 It’s not a sundae without tons of tasty toppings! I love to see all of the pretty sprinkles and nuts and candies displayed for a big visual impact on the dessert table. I like to alternate the more colorful toppings in a divided tray with more natural colored options, or use a variety of tiny bowls (luckily I have quite the collection). It’s also a great way to get kids involved – they can help sort out the snacks and create their own sundae creations. Lay out your tools. A really good ice cream scoop, and a small jar of hot water for warming it up and rinsing it out between flavors is a great idea to have on hand. 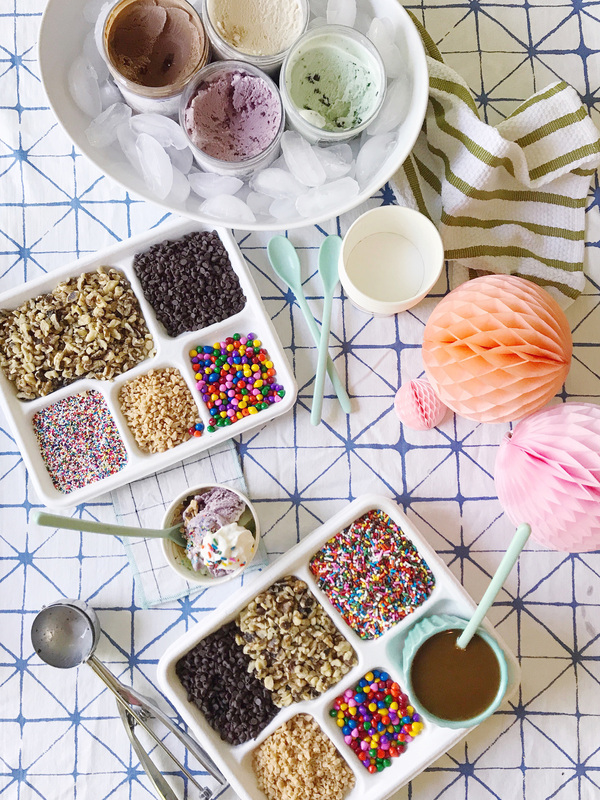 Some festive ice cream bowls and sundae spoons will finish off your display. 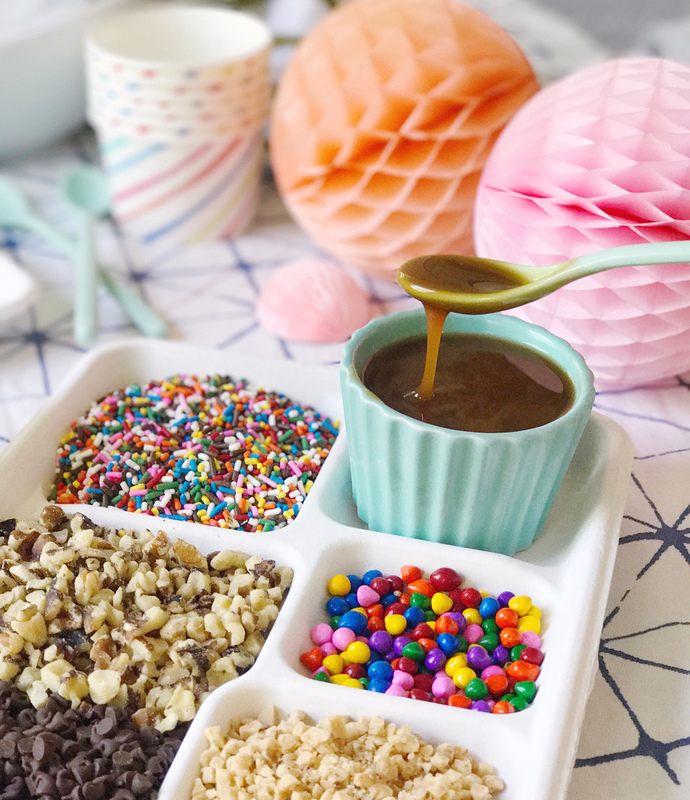 And don’t forget to set out some whipped cream and warm salted caramel sauce for the ultimate ice cream creations All that’s left to do is get scooping and enjoy! What’s your go-to sundae combination? I’m always in it for the whipped cream and rainbow sprinkles. Charred Summer Vegetable Salad. The Best Infant Toys.